In early December Sarah and I moved into a new apartment in the building adjacent to the one we had been living in. We were asked to move so that we could transition from a home with six teenagers to a home with eight teenagers. That may sound like a lot more work, and some days it is, but at the same time the apartment we moved into is nearly twice the size as the one we had spent the last year living in. 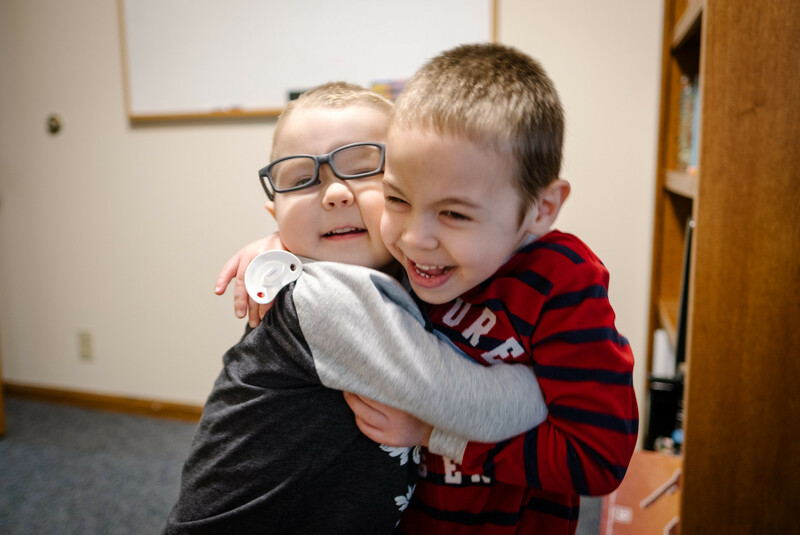 Each home at Boys Town has a section that is reserved for the family-teachers and their own biological family. In our old apartment we had three small bedrooms and a bathroom. We had no living room space or kitchen of any kind. It was cramped. But we were grateful for what we were provided. We learned to adapt. The new apartment has been life-changing for us. We have a living room space with a kitchenette. The boys have a small bedroom that fits their needs. I have a room for an office. And we even have a separate guest bedroom with a queen size bed and an attached bathroom. We also have a kitchenette with a two burner stove, a small refrigerator, a sink and some cabinets. It’s bigger than the kitchen we had in our apartment in Chicago, which literally had no counters. When I was a little, before my brother was born, my dad’s office was the bedroom next to mine. I remember waking up early, probably around 5:30 or 6:00, to see the light in the office on. Often I’d wake up and shuffle over to my dad’s office door. I’d carefully crack open the door to see my dad sitting at his computer working on something. To me, the computer just looked like a black screen with lots of letters and words on it, and his keyboard click and clacked loudly. There was often the smell of coffee wafting through the room, a smell that I grew to associate with my dad. I would quietly walk in and ask if I could sit next to him. He would say I could sit next to him if I was quiet. And so I would pull up an old chair and sit next to him as he typed away on his computer. I just wanted to be close to my dad. It didn’t matter if I understood what he was doing. He worked at a large wooden desk that he had always had, as far I as knew. Over the years the computers changed, but the desk they sat on remained. The desk made it through moves from various homes in Nebraska to two different homes in Indiana. I have no idea the brand or where he got it from, but I remember it being big. When you opened the side door of the cabinet, it had a distinctive wood smell about it on the inside. I can smell it even now as I think about it. No matter where the desk was, my dad hung many of the same photos and art above it. A couple baby pictures of me. A poster of Pete Townshend (that always kind of creeped me out when I was little), and a photo of my dad’s dad smoking a pipe in front of a back-lit window. An iconic Seaman family photo. I always liked being with my dad in his various offices. It’s clear even in the time before I have memories I spent time with my dad at his desk. When I went through my family photo album years ago, I found a number of photos of me with him at that desk. So it’s unsurprising to me that as an adult I’ve had a deep-seated desire to have an office of my own with a nice big, wooden desk. With the expanded space we have now have in our new apartment, I finally had the opportunity to fulfill that dream of mine. Recently, Sarah, the boys and I went out to Nebraska Furniture Mart to look at desks. There were a few that stood out to me. I went there knowing that I wanted one made of wood, not that cheap particle board stuff that might look nice for a few minutes before it disintegrates into broken pieces. I looked at a quite a few great desks. But one stood out to me from the beginning. I remember thinking that it reminded me of my sister’s desk that she had gotten a few years ago from my dad. It’s a sturdy oak desk with drawers on both sides. Not too big. Not too small. Just right. The goldilocks desk. Sarah and I determined we would not make any decisions that day and come back another time before we were to purchase it. After we returned home I texted my sister and asked her to send me a picture of her desk. Sure enough, the desk that I caught my attention at the furniture store is the same desk that my sister has. Perhaps a weird coincidence, but probably something deeper than that. It seems fitting for many reasons. The beds that my sons sleep on were my set of bunk beds when I was a kid. They’re sturdy Ethan Allen oak bunk beds, clearly built to last. My brother used them for much of his childhood, and then my sister used them when she moved out of the house. And now my own children have them. Me, sitting in my bunk beds on my sixth birthday. My sister also has the same oak, Amish-made side table that my dad got us when we were both kids. We both still have them (although I’ve had to glue the drawer back together once because my sons are destructive forces of nature). There’s something about that having that desk seems extremely peace-giving to me. The idea of finally having an office with a nice big wooden desk where I work and type on my computer every morning when my boys get up seems to complete an unfinished circle for me. Last week Sarah’s mom and her husband were visiting us from Indiana for a few days. After going to our new favorite restaurant in Omaha, we took them to a neat old fashioned candy store. There are many rooms throughout the old building, some of which are filled with old knickknacks from days past, most of which are for sale. 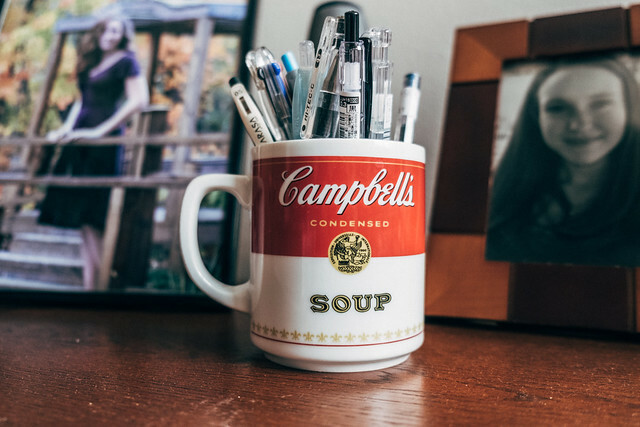 As I was walking through one of the rooms glancing at some of the items on the shelves there was something that caught my eye, a Campbell’s Soup coffee mug. If you go back up and look at a couple of the photos of my dad’s desk you’ll notice, if you’re searching in a Where’s Waldo sort of way, a mug with pens and pencils in it. It’s a Campbell’s Soup coffee mug. The mug at the candy store was not exactly the same, but it was often darn similar. It was only $4, and with me just getting a brand new wooden desk of my own, it seemed too much of a coincidence to not purchase the mug and set it up on my new desk. The space we gained in our new apartment has encouraged me to be more organized and mindful. I now use my desk every morning after Micah and Ezra get up. I make sure to always write something every day. This is a goal that I’ve had for myself for a while now, but have never made the space for in my day, both mentally and physically. I write every morning in response to a one word prompt provided by WordPress. It’s been very nice to get in this routine. I’m sure that it will also encourage me to write on this blog more often. If you’re interested in reading those posts, just let me know. The space I’ve given myself via my new routines has also led to me deciding to start therapy. I told my therapist that it wasn’t starting therapy for any sort of immediate crisis, but just as a way to have a more objective voice in my life. I’ve had two sessions thus far and I can tell that simply the process of going to therapy and talking with a licensed therapist for an hour is going to help my own mental health, my relationships, and the boundaries in my life, which are very blurred thanks to my job. I am definitely overdue for writing an update about Micah (and Ezra). I’ll do that fairly soon. In the meantime, Ezra turns FOUR in two days. I’ll probably write something soon about the gift we got for him, too. Thanks for reading and following along! I like to connect the dots in my life to see a bigger narrative going on. Nice big desks make plenty of room for plenty of stuff!